When you tell people that marriage is more of spiritual and not about s*x, money, cars, etc., they will say; "why are you always talking spiritual. God has given us choice to decide what is good for us." Self deceit! Many of those who promote such faulty ideas end up getting married to as much as 2, 3, 4 or 5 different people in their lifetime. It is when they are dead that their soul will know the consequences of those acts. NOTE: Out of every 10 people you meet in life, only about 3 can be your wife or husband. The possibility of making a terrible mistake is as high as 70% and that is why seeking Right Spiritual Counsel is very important as only a few usually get it right by themselves, by luck. I will reveal more about this later. 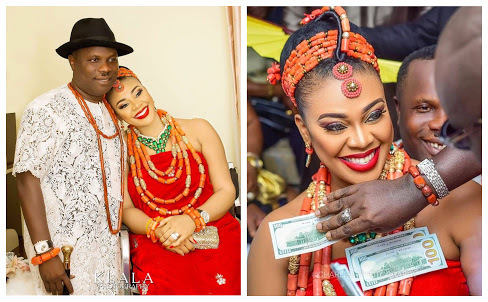 Popular Interior designer, Ehi Ogbehor has confirmed her less than one year marriage to Warri billionaire, Ken Bramor is over. This comes a month after he bought his first wife a Rolls Royce. Interestingly, in November 2017, Dollars rained at their wedding and they gave out cars as souvenirs. It's such flashy things that a misguided Adulterous Wife will see and call a beautiful second chance. But less than one year later, it's over. It was the second marriage for the Lagios big girl, Ehi, who has two kids from her first husband. She also has a daughter with Ken Bramor, making three kids with two different men already. Unto the next marriage or time to seek help?... it's up to you.